The elegant Villa is situated on the western shores of Lake Como, close to the town of Lenno and approximately 20 kms north of the town of Como, surrounded by a beautiful landscape. 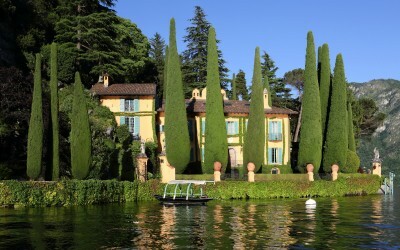 The villa represents the pinnacle of luxury on Lake Como, sharing the Punto di Lavedo with the historic Villa Balbianello and bestows guests with unique and unmatched views of Italy’s most mesmerizing lake within a private and exclusive setting. The villa was completely renovated and provides a unique mixture of highest quality Italian antique furniture, fine art and objects chosen from across Europe and modern amenities. On the ground floor, there is a large entrance lobby, a formal drawing room opening onto covered terrace and patio, as well as a dining room with a cozy fireplace. On the first floor, which can be reached through an external staircase are 4 very different yet equally luxurious bedroom suites: Master Suite – with fireplace, study and a Juliet balcony, the Lilac Suite – with access to a long coquette terrace, the Blue Bedroom and the Red Bedroom – with fireplace and antique wooden beam ceiling. Each suite has a King-Queen size bed and there are 4 en-suite marble bathrooms, 3 of them with bath and shower and one with shower. On the second floor of the air-conditioned villa there is a further king size bedroom – the Yellow Suite - and a modern studio suite with a lounge area and an ensuite bathroom with bath and shower. The studio is connected to a small single bedroom. Adjacent to the fully heated outdoor infinity edge swimming pool, finished with 22-carat gold reflective tiles lies the state of the art cinema and a spa style bathroom which services the fully equipped Technogym gymnasium. The house also contains a small kitchen to service the gym, cinema and the pool. The floodlit tennis court is located a short walk away through the Villa’s perfectly kept gardens. The Terrace House with panoramic lake views, private terraces and dining area is quietly situated beyond the tennis court.Completely separated and ensuring full privacy the Terrace House, spreads over two floors: On the ground floor is the living room with fireplace and kitchen facilities. Upstairs, there are two other king-size bed suites – with ensuite bathrooms, one with shower and the other with bath and shower - and a mezzanine sitting area. The outdoor area with loggia, terrace and the beautiful views offers romantic alfresco dining opportunities provided by the private catering service of the villa. Guests can enjoy a wide range of activities on the lake including power boat hire, sailing, wind surfing, kayaking. The perfect location of the villa offers access to other outdoor activities as paragliding, tennis, golf, hiking, cycling, quad biking. Villa La Cassinella is the perfect choice for a luxury holiday, during which you can enjoy both peace and adventure and, of course, the magnificent views provided by the surrounding landscapes and the Lake Como.